March 23, 1928: “The Gumm Family” (Judy and her family) performed at their father’s theater, The Valley Theater, in Lancaster, California. 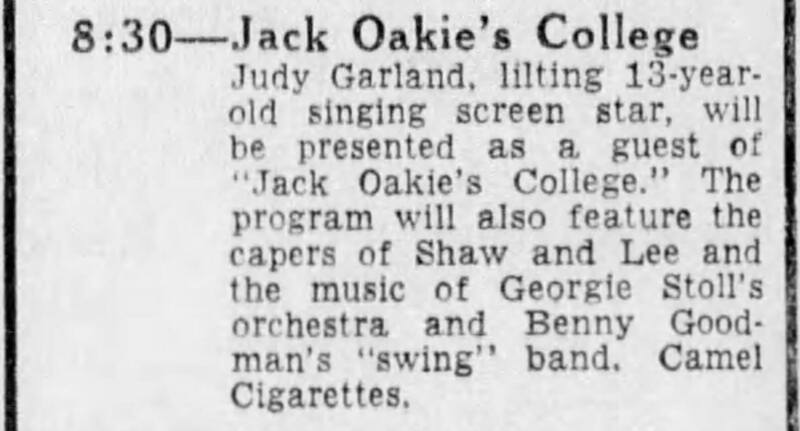 March 23, 1937: Judy made her weekly appearance on CBS Radio’s “Jack Oakie’s College” show. There are no records of what she sang although according to the newspapers on this date she was joined by Frank Fay and John Boles along with Georgie Stoll & His Orchestra on the West Coast and Benny Goodman and His Orchestra linked up from the East Coast. 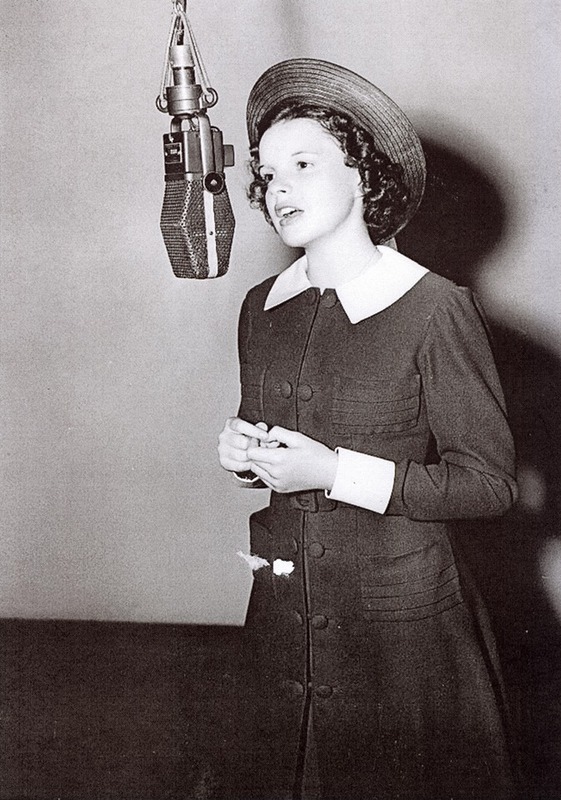 At this time Judy was in the middle of pre-recording sessions for Broadway Melody of 1938. 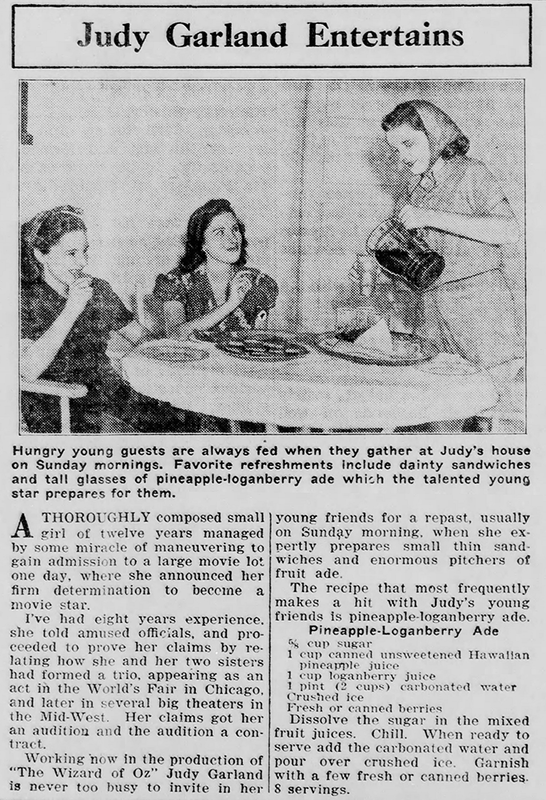 March 23, 1939: Judy serves her sisters (standing in as “hungry young guests)” some pineapple-loganberry ade made with her own recipe. 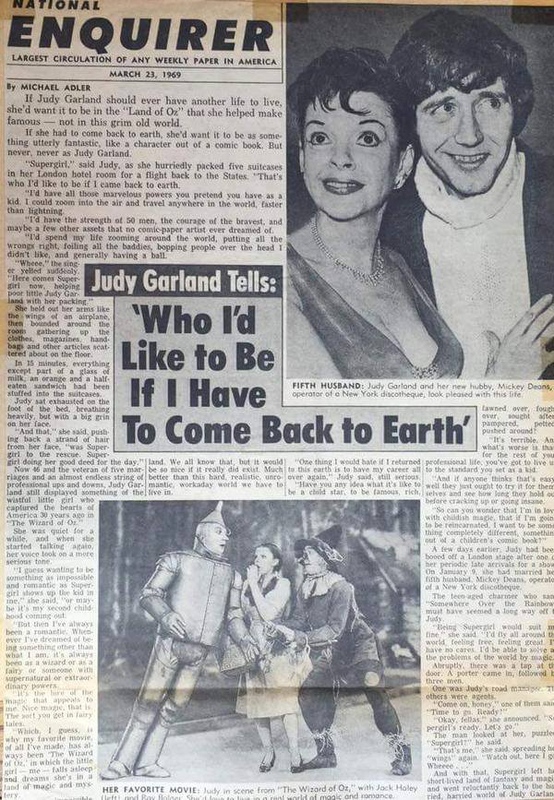 This is more fiction from MGM, including the opening bit about Judy marching onto the MGM lot demanding an audition. 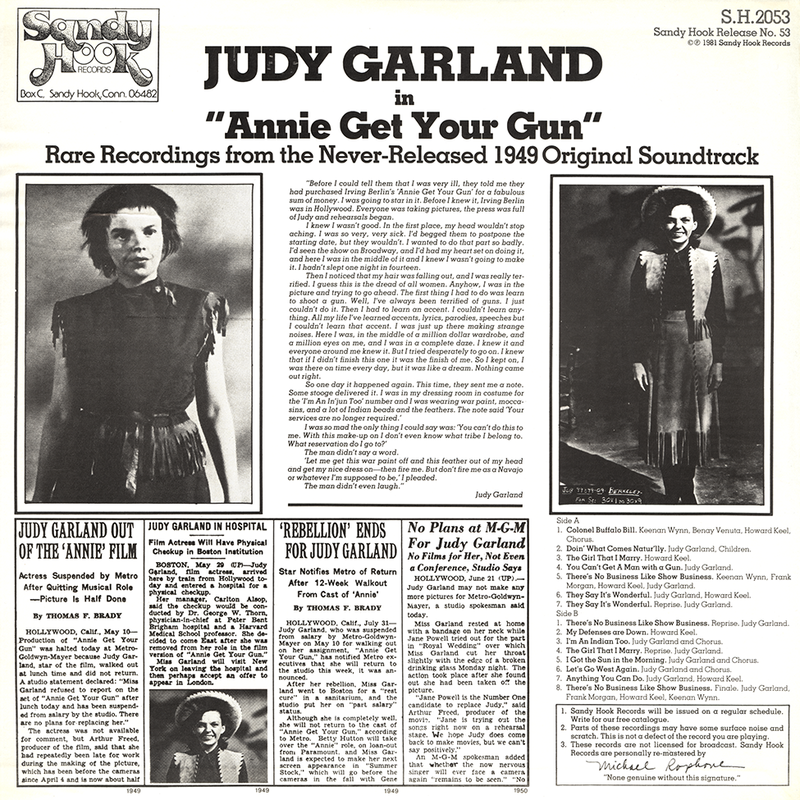 The studio liked to put out that story to the papers as a way of making Judy seem more precocious than she already was. 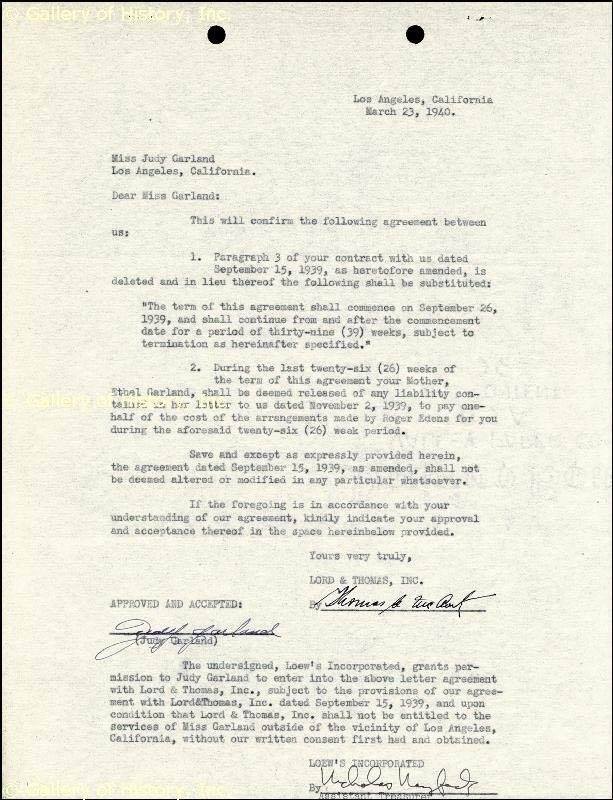 March 23, 1940: Judy and her mom, Ethel Gumm, signed this agreement with Lord & Thomas, Inc. regarding payment of services by Roger Edens (seen in the photo above rehearsing with Judy). March 23, 1941: More studio generated fiction, this time about Judy sporting a pompadour hairdo that didn’t go over very well with her mother. March 23, 1942: Hedda Hopper reported on Judy’s weight loss and a supposed conversation between Judy and MGM studio boss, Louis B. Mayer. Oddly enough, in spite of the headline, there’s nothing in Hopper’s column about MGM ordering Judy go back to red hair. March 23, 1943: Filming continued on Girl Crazy on the “Interior Post Office” and “Interior Dean’s Office” sets. Time called: 10:00 a.m.; dismissed: 6:10 p.m.
March 23, 1944: Filming continued on Meet Me In St. Louis on the “Interior Lower Hall” and “Interior Dining Room” sets. 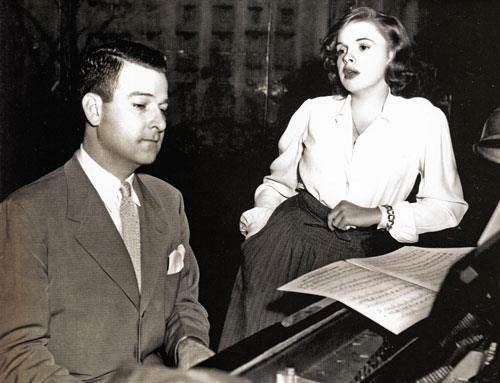 Time called: 10:00 a.m.; Judy Judy arrived at 10:12 a.m.; dismissed: 6:00 p.m.
Photo: Judy and director Vincente Minnelli on the set around this time. Check out The Judy Room’s Extensive Spotlight on Meet Me In St Louis here. March 23, 1945: Filming on The Harvey Girls continued on the “Interior Harvey House Party” set. 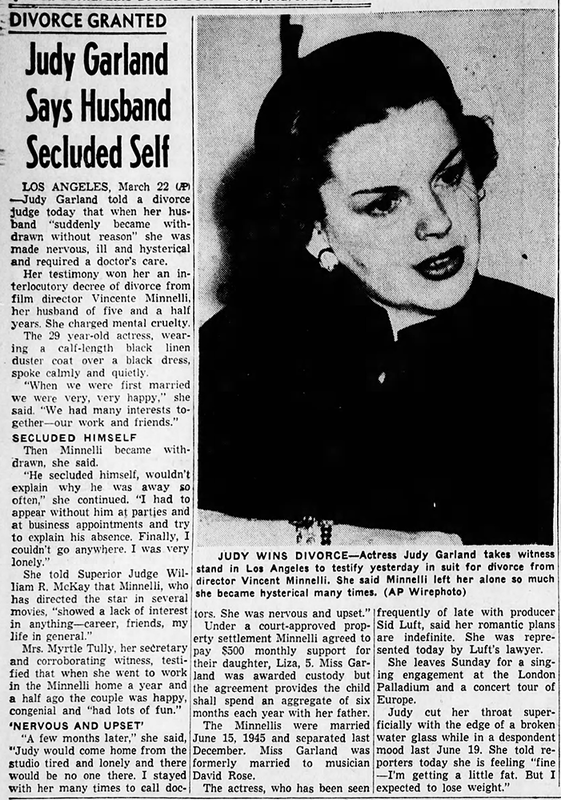 Time called: 10:00 a.m.; Judy arrived at 10:30 a.m.; dismissed: 5:10 p.m. It’s noted that Judy went home ill, although according to the records she still put in a full day. She was out sick the next day. 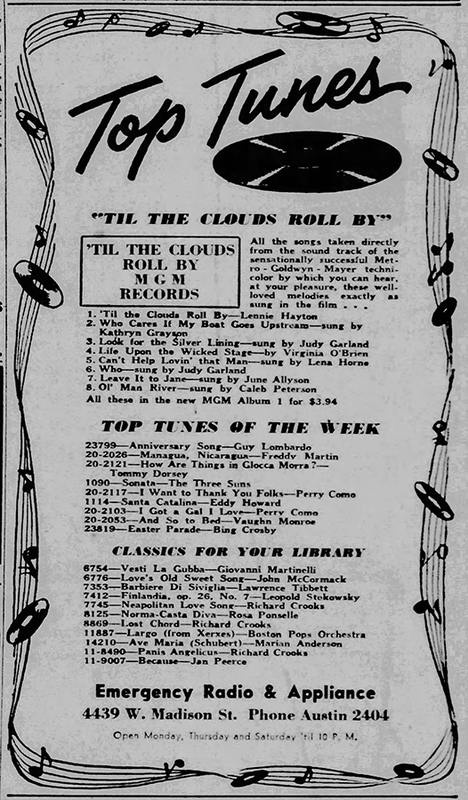 March 23, 1947: Here is another ad for MGM Records’ very first album, the soundtrack to Till The Clouds Roll By. 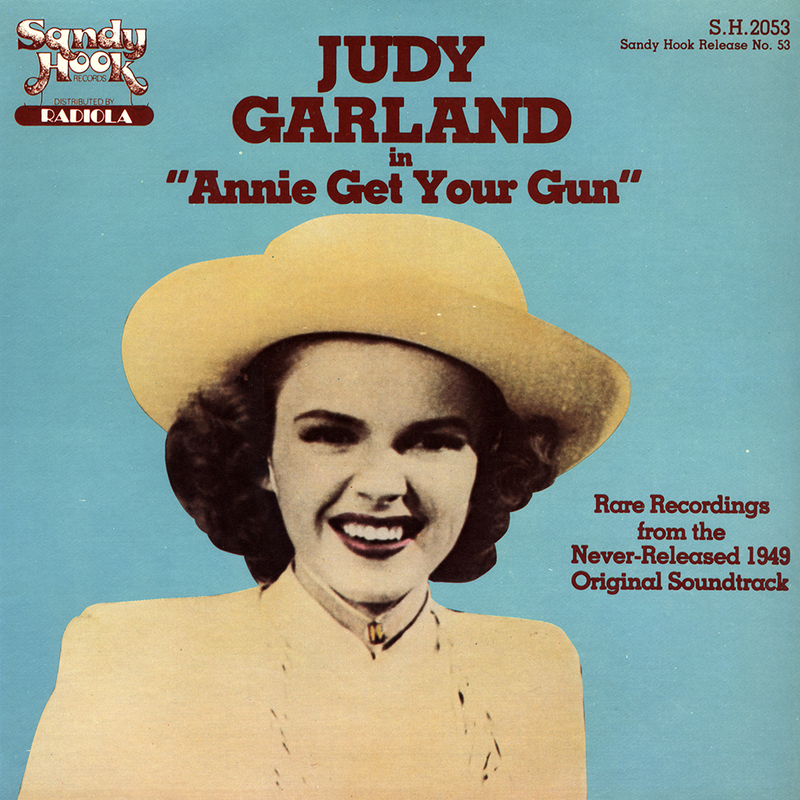 March 23, 1949: Rehearsal #10 for Annie Get Your Gun. 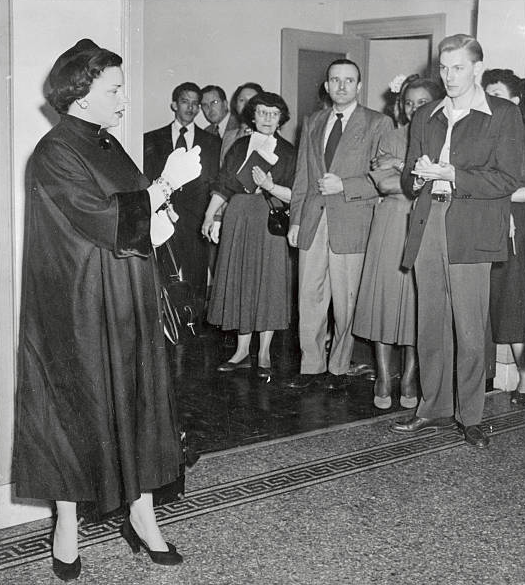 Rehearsed on this day, “There’s No Business Like Show Business” and “Doin’ What Comes Natur’lly.” Judy arrived at 11:00 a.m.; dismissed: 4:00 p.m. Photos above: The 1981 Sandy Hook Radiola bootleg LP of the recordings. Download the complete soundtrack album here (zip file 44mb). Thank you, Joseph E., for providing this! March 23, 1950: Judy’s final portrait sitting for MGM in their famed portrait studios. The photos, taken by Virgil Agger, were used in promoting Summer Stock which turned out to be her last film for the studio. 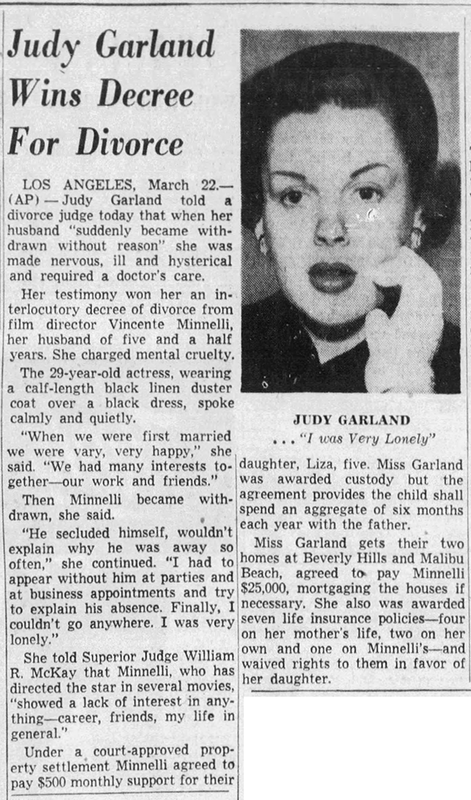 March 23, 1951: The news of Judy’s appearance in a Los Angeles court for her divorce from Vincente Minnelli on March 22nd hit the papers. 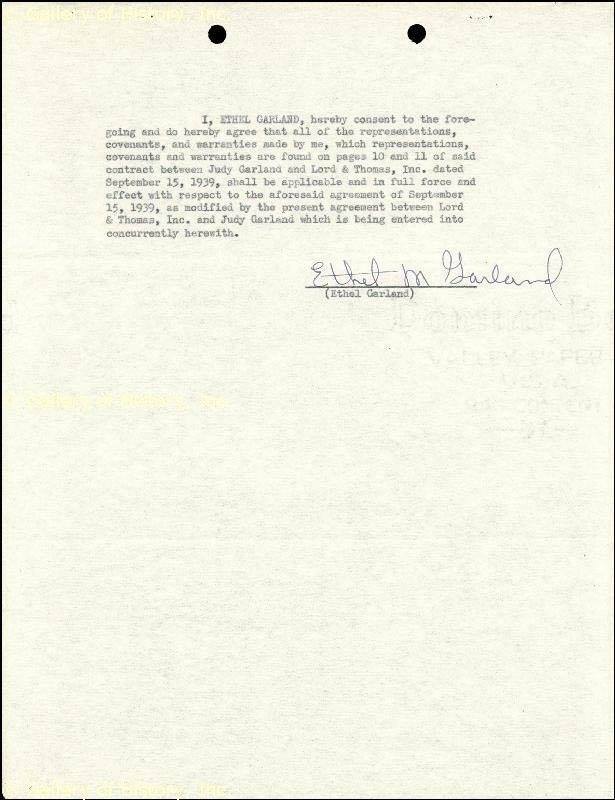 The divorce was granted although it did not become final until March 21, 1952. 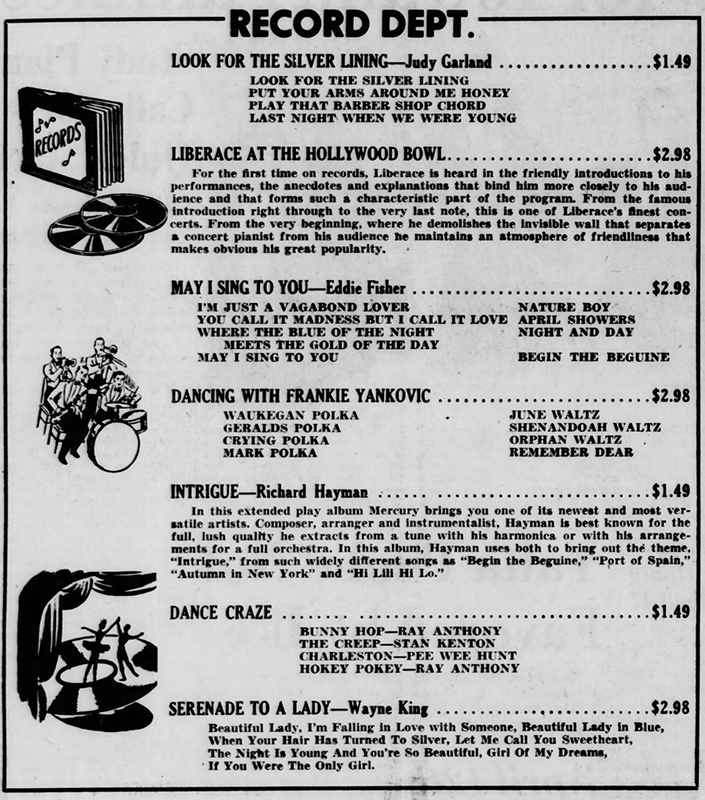 March 23, 1955: Here is a rare add for the MGM Records 45rpm “extended play” compilation record, “Look For The Silver Lining.” The record did not have a 12″ counterpart and only feature four songs. 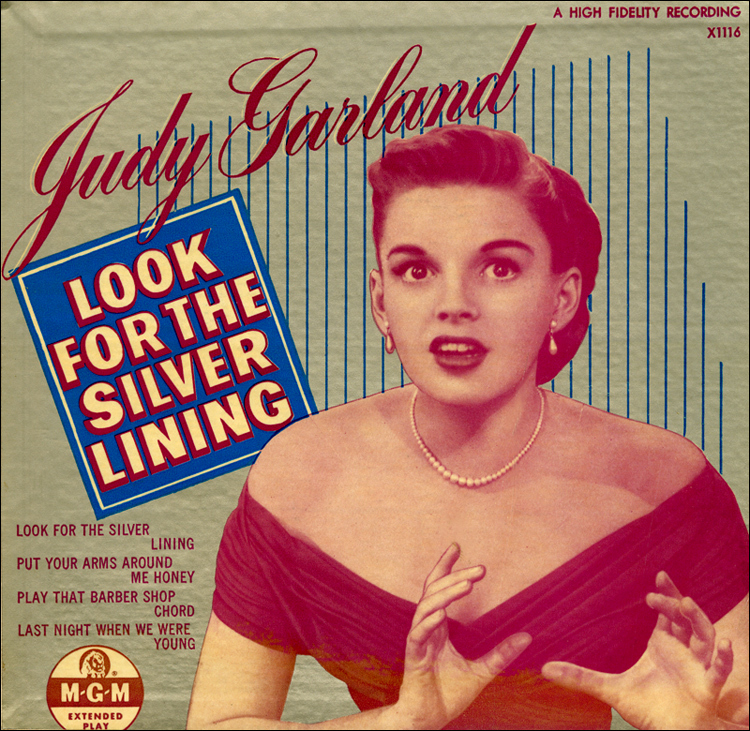 Check out The Judy Garland Online Discography’s “Look For The Silver Lining” pages here. March 23, 1958: “Judy is that once-on-a-lifetime entertain – and this album proves it…” Here’s another ad for the Capitol Records “Judy” LP. The album was originally released on October 10, 1956. March 23, 1961: Louella Parsons reported that a “slim” Judy received applause from the cast and crew of Judgment at Nuremberg. Alo mention was the upcoming film adaptation of “The Lonely Stage,” which became I Could Go On Singing and the upcoming Carnegie Hall engagement. Of interest is Parsons’ claim that Judy told her she would be going to Monaco to attend Princess Grace’s (Grace Kelly) Little White Bed charity affair that August. That never happened. 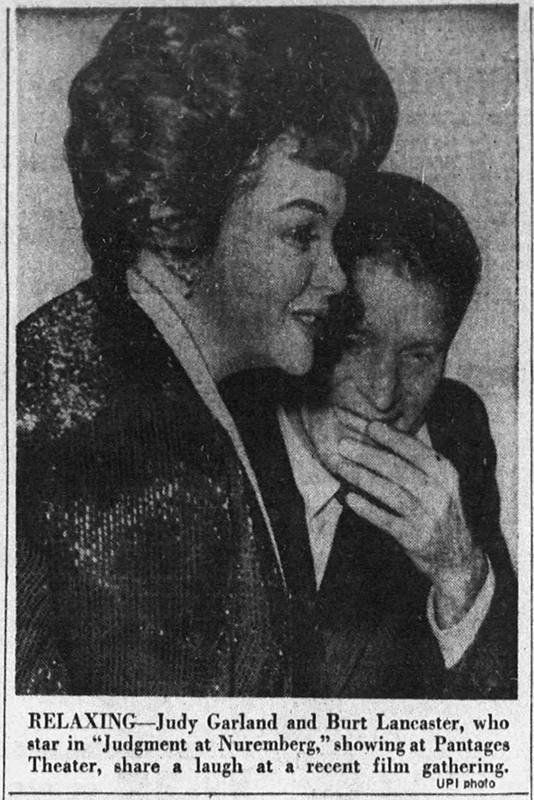 March 23, 1962: Here’s an unusual photo of Judy and Burt Lancaster “at a recent film gathering.” The two had recently starred in Judgment at Nuremberg and would soon appear in theaters co-starring in A Child Is Waiting. 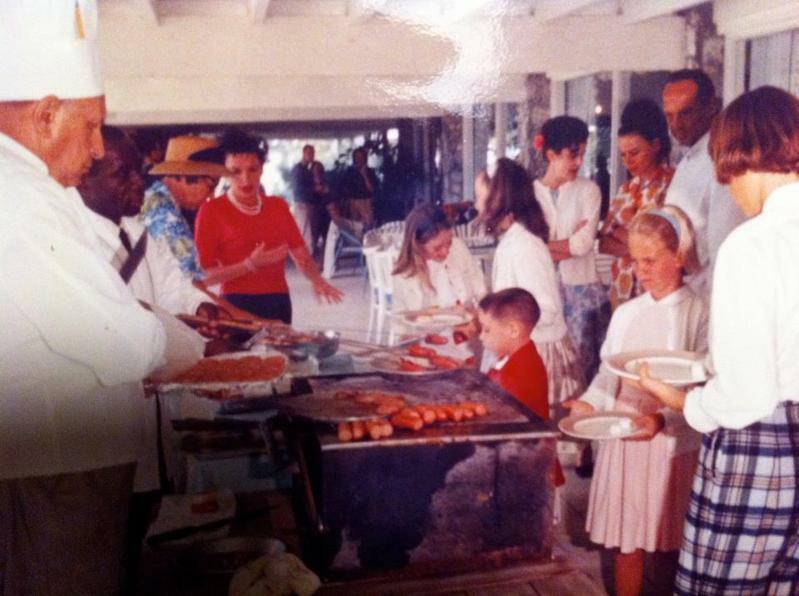 March 23, 1963: Judy and family enjoyed a nice vacation in the Carribean during which this snapshot was taken at a BBQ. An audio recording was made of this concert, in mono, although it would be dubbed in the film with the audio from Judy’s next concert in Copenhagen. 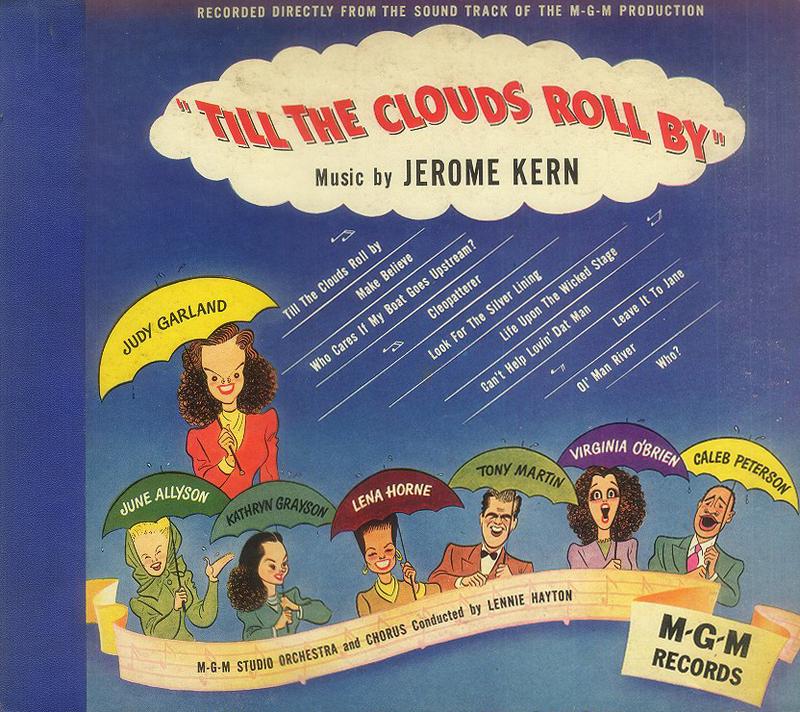 Only the audio of Judy and Johnnie Ray singing “Till The Clouds Roll By” remained. The photos above were taken of Judy (and Johnnie Ray) in concert in Malmo, Sweden, and published in the local papers. Below, a “National Enquirer” article published on this day. Image from The Rick Smith Collection. Thanks, Rick! Those final MGM pictures are extremely intriguing. And, to me, hit and miss. Some are beautiful, but others seem to reveal how really done she was with Metro. The one you picked for your top picture for the day is dazzling!!! Thanks so much. Hit and miss indeed! Forgive me, but she looks drugged.